Sunday night Ms. Shirley, just south of DFC, called ACES that a large croc that was residing under her front steps was back. ACES team raced to the location and within minutes Vince Rose, ACES Animal Behaviorist, snared the six-foot reptile. Amazingly enough, the croc was fairly healthy despite its severely broken lower jaw. The injury appears to be several years old and very possibly inflicted by man. Other than being slightly underweight, and having a hungry, growling tummy, the croc was extremely feisty and compensated for the injured jaw with an extra strong tail. The crocodile had become problematic the usual way, being fed by humans. After careful inspection, the team decided it was best to leave the jaw as is rather than trying to fix it. The injury is completely healed with no signs of infection; and although when the animal bites down its top teeth penetrate the lower jaw, the teeth have worn perfect channels and the croc is not hurting itself. To fix it would mean dangerously putting the animal under anesthesia and setting it with pins. The fact is the croc would have a hard time recovering. Because of its bite force it would most likely have an extremely difficult time healing without re-fracturing the corrective process. “Jaws” now needs a home. First, it is a problematic crocodile and even with its injury it is still very capable of inflicting harm to someone. Secondly, if re-released Jaws would most likely, sooner or later, be killed by a larger croc or human because of its injury. Therefore ACES is very excited at the opportunity to open a much needed crocodile sanctuary here on the island. Not only would it provide a home for injured crocodiles, such as Jaws, but ACES would be able to treat ill crocs for re-release; house problematic crocs here on the island or at least hold them until they can be transported to the main facility in Ladyville; and provide shelter for young crocs that are living in high residential and development areas. 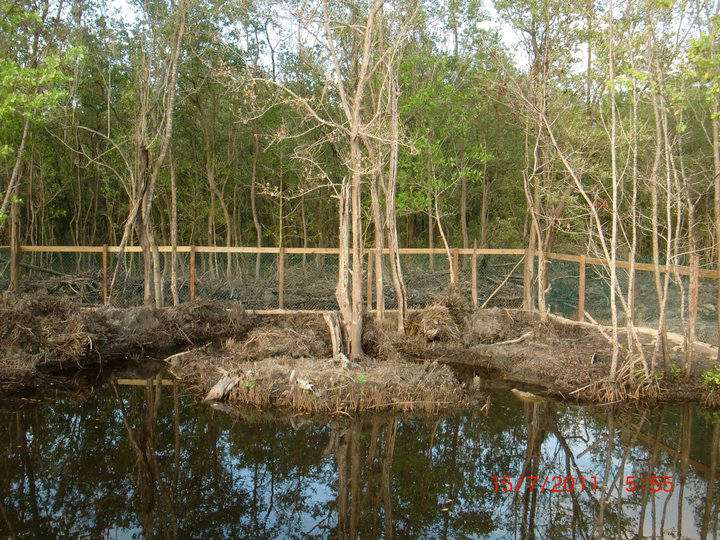 The Sanctuary would not only be an excellent tourist attraction, for self-sustainability, but would be an educational institution for locals on crocodilians, mangrove habitats, and croc conservation. 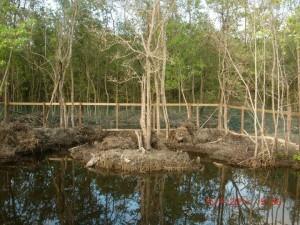 While the location is still being determined, anyone wishing to help can donate in numerous ways: in-kind donations of fencing, form boards, concrete and rebar are needed for securing a natural habitat for the crocs; labor will be needed for the construction of the facility; a small building for visitor information and hands on displays would eventually be needed and constructed; and donations are always appreciated either directly to ACES at Belize Bank Acct # 630-2-2-21-5255, or through ACES 501(c)(3) USA partner ‘The Belize Economic & Ecological Development Fund’ for secure, online, tax-deductible donations. The crocs’ future and the safety of others depend on you! 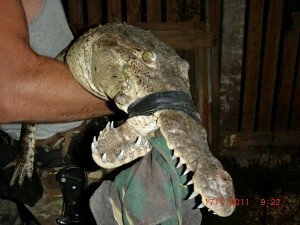 On Friday, July 15, 2011, ACES team successfully relocated Belize’s largest croc in captivity, George. Measuring an impressive 14 feet in length, George, along with Xanadu from the arsoned ACES facility in Punta Gorda were relocated to the new ACES Educational Crocodile Eco-Sanctuary in Ladyville at Caribbean Shrimp Farm, Ltd. Still under construction, ACES is raising funds for the construction of at least three more natural croc habitats, a visitor center with hands-on displays and a research station with bunks for students. Caribbean Shrimp Farm is Belize’s newest and most fascinating Eco-tourist attraction yet. A small sustainably minded organic shrimp farm surrounded by a privately protected wetland habitat, the 266-acre farm offers travelers and locals alike a great diversity of experiences: catch your own shrimp and have them cooked at the new “Captain Hook’s Shrimp Restaurant & Croc Lounge;” learn how shrimp grow on the educational shrimp farm tour; enjoy exotic bird watching and maybe catch a glimpse of endangered Jabiru Storks; walk through time on the Mayan Nature Walk that meanders through the jungle and is littered with ancient artifacts; and of course, an educational crocodile experience at ACES/American Crocodile Education Sanctuary. All located at one spot, just head North 1.5 km from the International Airport road junction and turn right on Marge Road (look for the rocket on the corner). Then drive 1.8 km straight down to the gate. Caribbean Shrimp Farm and ACES will be open for tours between 8am and 5pm daily. ACES grand opening to be announced.